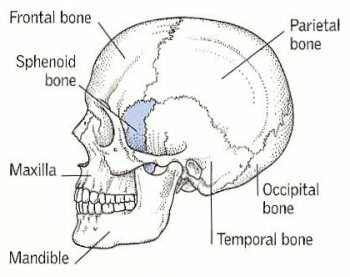 The sphenoid bone is an irregular, wedge-shaped bone at the base of the skull (the Greek sphenoeides means "wedgelike"). It is notable in that it makes contact with all of the other cranial bones. It spans the skull laterally helps form the base of the cranium, the sides of the skull, and the floors and sides of the orbits (eye sockets). The sphenoid bone is considered anatomically to have a central body, two greater wings, two lesser wings, and two pterygoid processes. The greater wings form part of the sides of the skull, and also extend inward to form part of the back surface of each eye socket. The two lesser wings form a small part of the back surfaces of the orbital cavities, and meet in the middle of the skull. Along the middle, a portion of the sphenoid bone rises up and forms a saddle-shaped mass called the sella turcica (Turk's saddle). The depression of this saddle is occupied by the pituitary gland. The sphenoid bone also contains the two sphenoidal sinuses, which lie side by side and are separated by a bony septum that projects downward into the nasal cavity, and channels for the optic nerve and other nerves.